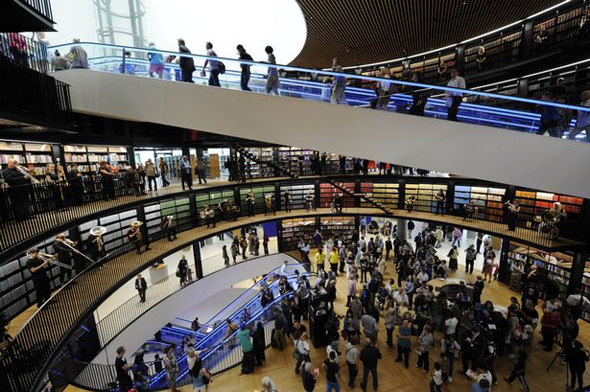 Thousands of people have flocked to the new Library of Birmingham since it opened on Tuesday - but not all have had a smooth ride. Despite costing close to £190 million, engineers had to free six people trapped in a glass lift yesterday, on the first day the elevator was open to the public. The group were stuck for 45 minutes before help arrived. A library spokesman said: "There was an incident this morning during which six people were trapped for 45 minutes in the glass lift which goes from the fourth to the seventh floors. "Today was the first day the lift was used by the public. The people were rescued as quickly as was possible, and were given food and drink afterwards as they recovered. "The lift is now temporarily closed while assessment work is undertaken to minimise the risk of such an incident happening again, and to minimise the rescue time required."